you experience this moment. Empathize with the perspectives involved in the present moment. It is easy to rush through moments, meetings, projects, emails, and calls, it takes skill, focus, and respect to truly just be in the moment. Being in the moment is one of the most essential aspects of practicing gratitude because it is the foundation seeing, feeling, and experiencing oneness within every situation. It helps you to see how your action impacts others, and how others’ actions have come to impact you in the present. The ability to see the macro and micro view of a situation will provide you with perspective. Listen. Most don’t listen. I mean truly listen. Listening plays a huge role in practicing gratitude as it is the key skill to be engaged within an organization, team, client, and well, really any situation. To increase your listening skills, be in the moment. This means to omit or at the very least, minimize distractions that would take away from listening. Practice active listening that aids in truly understanding, engaging, and recapping what is discussed. Showing such respect will not only provide you with a greater perspective, but will illustrate respect to the sender. I can’t tell you how many times, I have been thanked by clients, colleagues, leadership, and well, strangers, for listening. The interesting thing, is that this should already be common sense and regular practice for people, but you would be surprised how distracted people are when they try to lead, engage, or even build relationships with people. Ultimately, such distractions take aways of the nectar that is created through listening. The wealth that emerges from listening provides an abundance of gratitude opportunities. align with objectives. Doing so provides perspective to you, the receiver, and those around hearing such sincere words. Such specific and genuine communication makes people feel respected, valued, and appreciated. Furthermore, it shows confidence and strength by the receiver that creates an example of meaningful feedback, contribution, and care not only for the individual to whom the messaged is expressed, but to the organization, client, or whomever is impacted by such actions. Inspire. Meaningful illustrations of gratitude inspires others. 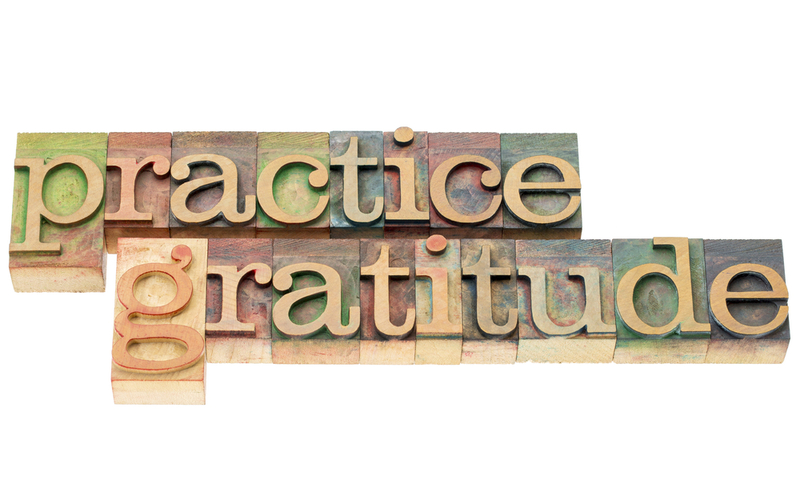 An office, team, and organization that shares gratitude will inspire more gratitude. Gratitude will aid in employee engagement, productivity, and satisfaction. Such awareness, perspective, and respect of identifying, empathizing, and communicating gratitude will inspire others to act in gratitude. For many, gratitude doesn’t come naturally, rather like a garden, it must be cultivated, cared for, and the fruits of the harvest shared. Creating and nurturing an attitude of gratitude can go a long way personally and professionally. Rather than nonchalantly practicing gratitude over the holidays, proactively engage in the behaviors, attitudes, and actions that build gratitude. You may just encounter a greater level of humility, peace, and confidence. Furthermore, such a lifestyle may inspire others around you to gain a deeper perspective, potential, and productivity within the workplace. Cheers to practicing gratitude daily with purpose!